Hello dear crafters! 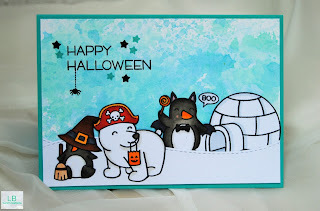 As promised I show you the last Halloween card for this year!!! For the background I used a spiderweb stencil and the distress inks seedless preserves and spiced marmelade which I blended together. I was quite surprised by how seedless preserves turned out in combination with the bright orange, I think I expected that there will be more violet but I like the result anyway. 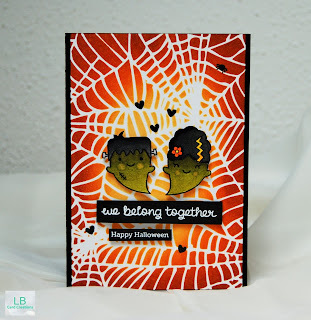 I stamped and created two Frankenstein ghosts from the 'Booyah' stamp set from Lawn Fawn and colored them in with Zig clean color real brush markers. The sentiments are from the 'Milk and Cookies' stamp set from LF and 'Bootastic' from Mama Elephant (the tiny Halloween greeting). I stamped them both with Versamark ink on black cardstock and heat embossed them with white embossing powder.Then I fuzzy cut the images and adhered them with foam tape to the card. I did the same with the greetings. I didn't want to cover my background too much because of the nice colors and the spiderweb; therefore, I only added some black hearts and one little spider using the 'Booyah' stamp set again. I covered the hearts with clear Wink of Stella glitter and glossy accents and my card was finished. I wish you all a 'spooky' Halloween and happy haunting!! Thank's for stopping by and I'll see you soon! 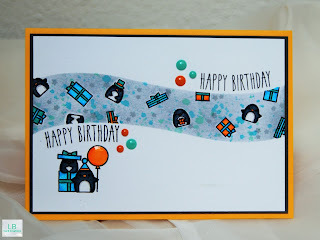 So for my card I used a watercolor paper and created my own mask with the negative diecut pieces of the landscape trio die (I used the hill boarders). Then I stamped the cute images with ranger archival jet black ink and fuzzy cut masks for them as well. After masking them off I colored the background using the soft granite shadow ink from Hero Arts and an ink blending tool and sprinkled it with distress inks in cracked pistacchio and peacock feathers. 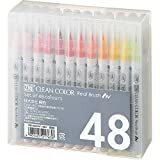 I then could remove the masks and colored my images with Zig clean color real brush markers. I also added two of the penguins under the penguin border (again using masking and Zig clean color real brush markers). From the 'Woodland Gift' stamp set I stamped the balloon and greeting. 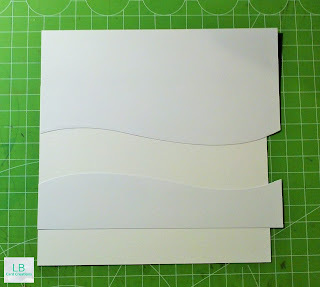 To match the wavy border I curved the sentiment stamp on my acrylic block. For finishing my card up I added wink of stella to the presents and also (together with glossy accents) to the balloon. 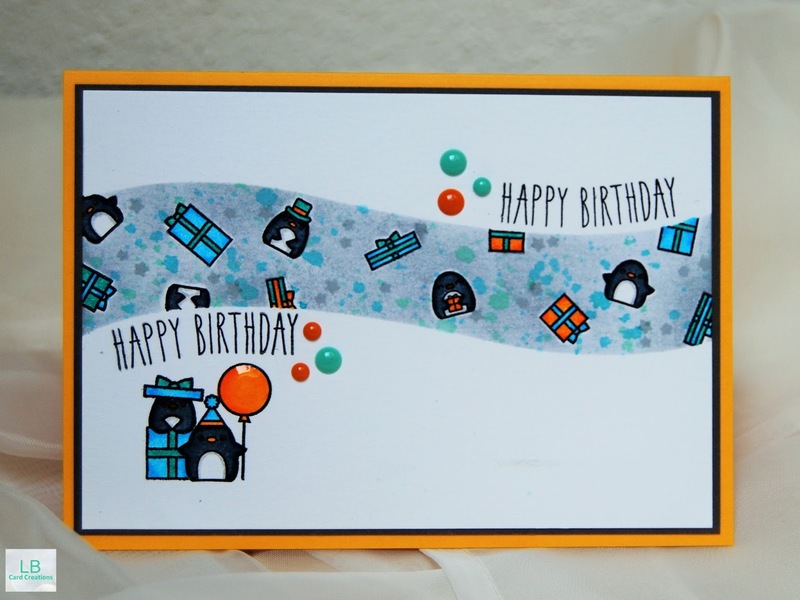 I chose some enamel dots in the same color combination and added them around the greetings. Last but not least I adhered the watercolor paper to a dark grey cardstock and then to a standard-size orange card base. Hello and happy Saturday! It's time for another Christmas card. I created an interactive card, similar to the Halloween card which I posted about two weeks ago. 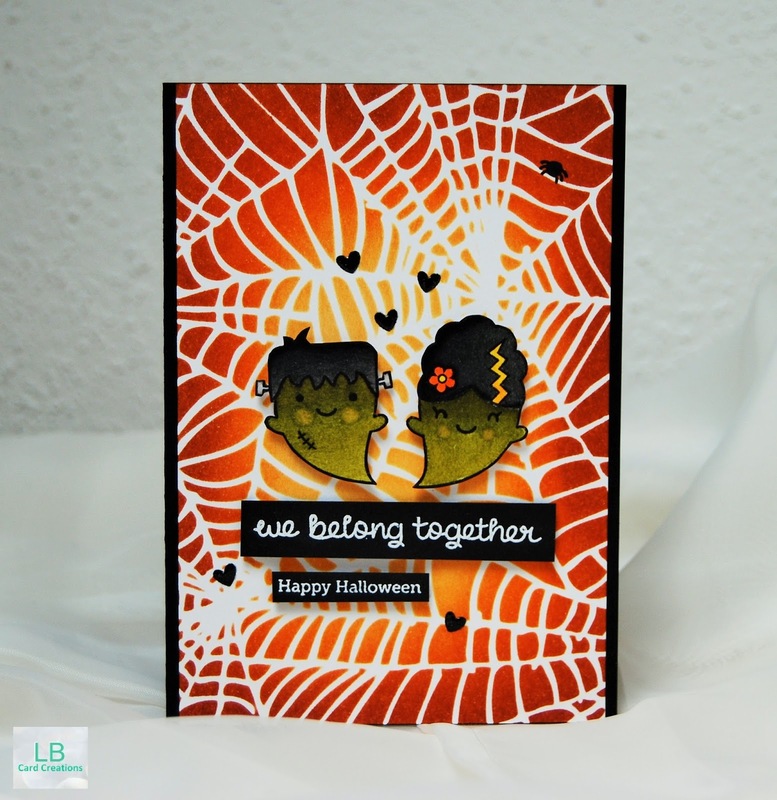 Click here to see the Halloween card. 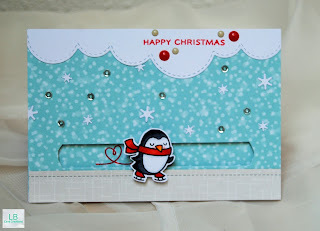 For the Christmas I card I used the 'winter penguin' stamp set from Lawn Fawn. I stamped the penguin with Memento tuxedo black ink and colored it in with Copic markers and the Wink of Stella pen. For the background I used the let's bokeh in the snow paper pad and cut out a strip which is slightly narrower than a small coin. 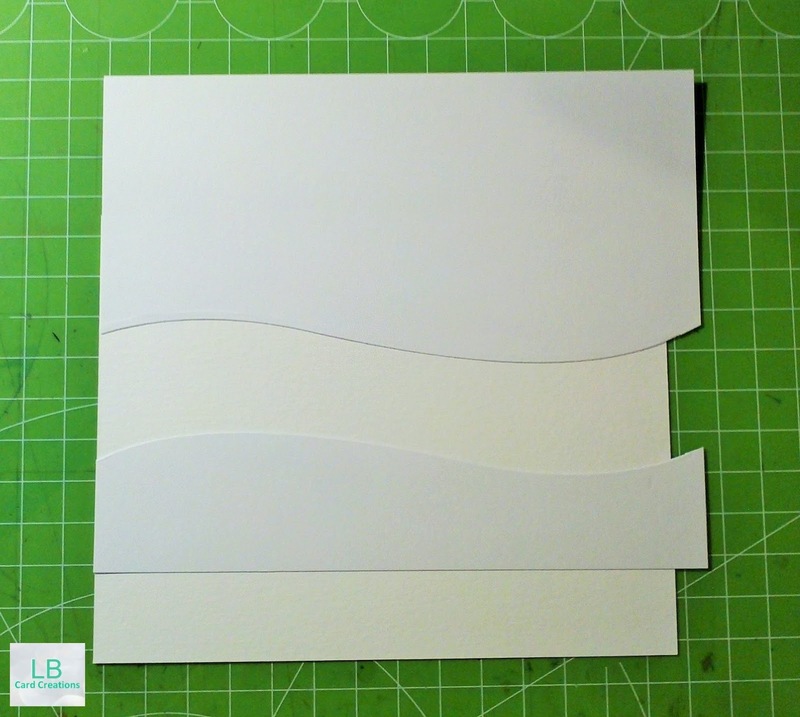 I also diecut a cloud border from white cardstock using the landscape trio dies from Mama Elephant. 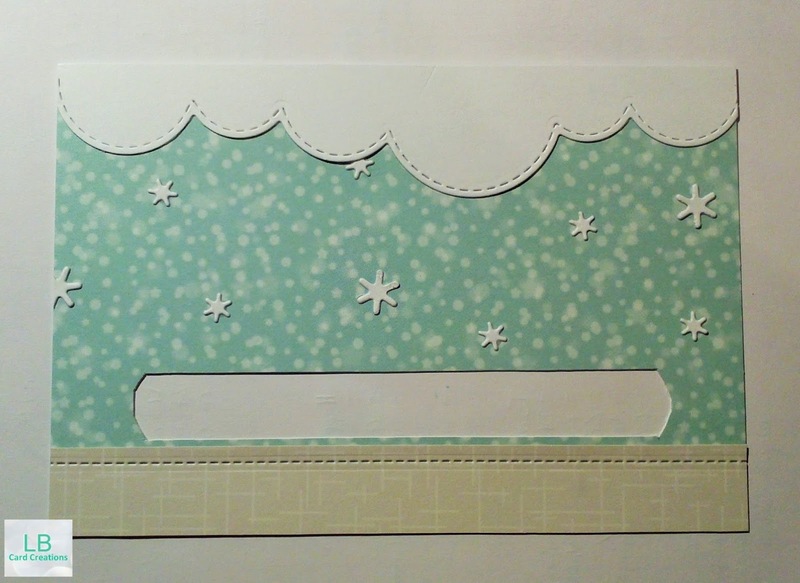 For the ice I used a pattern paper from the Avery Elle neutrals collection paper pad and diecut a stitched line to match the ice with the cloudy border. I also adhered the same paper from Lawn Fawn directly to my white cardbase so that the white isn't showing through the slit. Then I created a coin-foamtape-coin construct (you can also see this in the Halloween post to which I linked to at the top) and clued my Penguin to it. I used glossy accents for this because it is a nice strong adhesive. 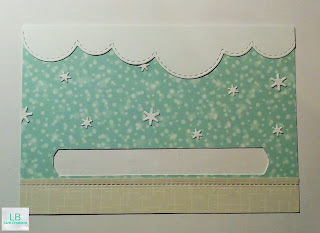 In the next step I adhered the whole interactive card front with foam tape to my cardbase and scattered some sequins and also snowflakes which I diecut with the mini snowflake die from white cardstock. For the sentiment I used the 'Oh snap' stamp set and the lobster LF dye ink. I also added the heart from the set with the same ink and used enamel dots to ground my sentiment. 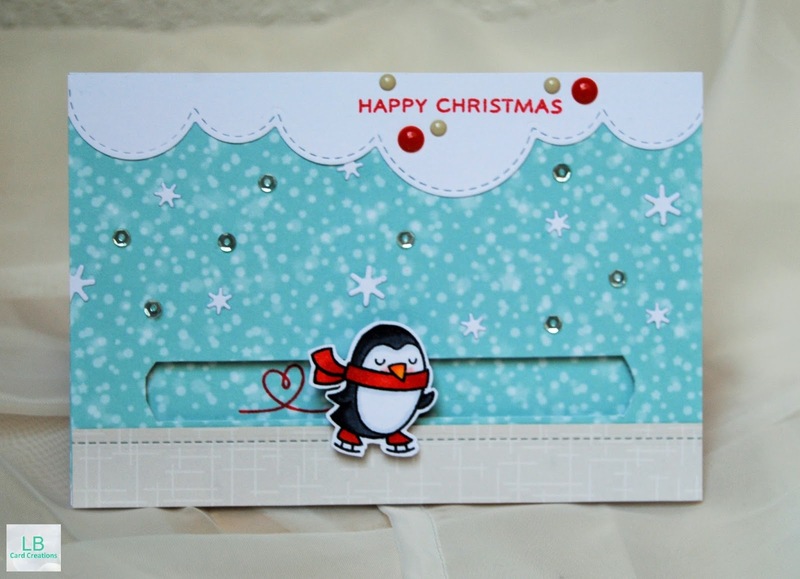 I think the person who will receive this card will have a lot of fun with this interactive design!